Available in color choices that include black, white and blue, our 100% polyester baseball caps can be printed or embroidered with your full color logo design or special message. These adult size constructed caps feature 5 panels with sewn eyelets, cotton sweatband and strap Velcro closure for a comfortable fit. 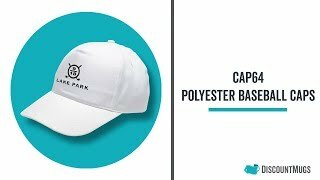 Great for both little league and school teams, company gatherings and other events, or that fundraiser you’ve been planning – these printed polyester caps are affordable supplies that will help you identify team members and supporters alike. Start designing now with the help of our d-lab interface and upload your artwork, or select from our clipart and fonts to create striking images that represent your organization. Great service, price and product. Fast shipping and keep me updated on delivery time. Would highly recommend. I was very pleased with the quality of printing on the hats I received. I had gotten embroidered hats from another vendor in the past, but the text was too blurry. These hats are crystal clear! I love the caps and are one of our best sellers! Awesome hats! looked better than I ever imagined! Thank you so much! From concept to completion it was a pleasure doing business with you!